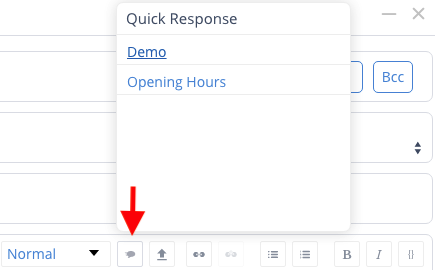 Quick response makes it possible to quickly insert a template into any conversation and can be added using the Quick Response button or by typing '=' followed by the template name. Quick responses are available when composing an email, replying to an email and in chat. Click the Quick Response button to insert it in the reply. Write =template name to search for a quick response to insert. The Quick Response template has been inserted.